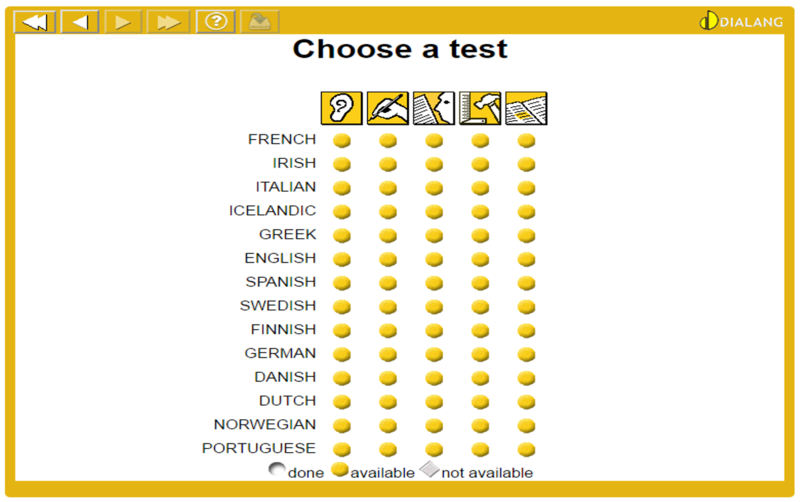 DIALANG was designed primarily for European citizens to assess their language abilities in adherence to Europe’s Common European Framework of Reference – CEFRL – as a basis for determining language proficiency. The CEFRL is a widely recognized framework used to describe and measure the language proficiency level of a learner in a particular language. DIALANG is not an exam and does not issue certificates, but can be used by learners to systematically self-assess their language skills, identify specific weaknesses and work on them, as well as introduce both teachers and learners to the CEFRL. DIALANG is a very useful tool for learners to self-assess their language skills, and for teachers to support them in this by integrating it into their course work. It can also help to introduce learners to online-assessment of language skills as a tool used increasingly in application processes for international scholarships and exchange programmes. Click on the DIALANG logo, or the play button, to take a test. Choose instructions in your first language on the scroll down menu. Click on the white arrows in the top left corner of the frame appearing on the screen to move forward or backward in the process. The length of a typical DIALANG test session is 30-45 minutes, but you may choose to skip the optional placement test and the self-assessment tasks (allow 20-30 minutes to complete the language test only). Note: tasks are not timed, you may take as long as you wish to complete the tasks. After the test, you will have the opportunity to explore the different kinds of feedback. Since the aim of DIALANG is for learners to self-assess their skills, the test results should not be used directly for their assessment by the teacher. Learners could use DIALANG to self-assess their progress in developing specific skills that their language course aims to develop, and could be used as part of continuous assessment. Students could reflect on their experience with DIALANG in their course portfolio (alternatively in an essay or exam). A similar assessment framework can be used to monitor learner’s language skills before, during and after their year abroad.